Conergy is Coenzyme Q10 (Co-Q-10) Capsules, also called Ubiquinone, is found in the mitochondria of all living cells and is concerned with the biochemistry of converting food energy into cellular energy. In certain people it is difficult for the body to manufacture adequate amounts of Co-Q-10 or extract it from food. So, in spite of a healthy diet they constantly feel week, tired and run down. Conergy Capsules is specially formulated by dissolving Co-Q-10 in Soya Oil. This process optimises absorption and utilisation by the body cells and contributes to the release of energy from within. 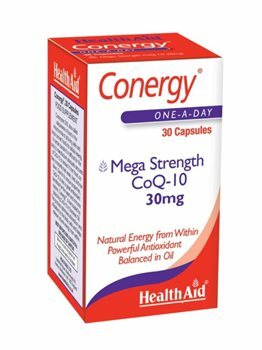 Conergy Co-Q-10 30mg Capsules can be taken daily to contribute to the increase of energy levels, or reduce symptoms of cardiovascular disease and gum disease. Bulking Agent (soybean oil, vegetable oil, beeswax), Capsule Shell [gelling agent (gelatine), humectant (glycerol, purified water), natural colours (red and black iron oxides)], Coenzyme Q10, Vitamin E (d-alpha tocopherol). Adults and children over 12 years of age, one capsule daily. Can be increased to two or three capsules daily if required. Do not exceed recommended daily intake unless advised by a suitably qualified person.